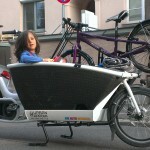 It’s been (over) a year now, since we brought home the whale, our UrbanArrow. And it’s been a wonderful year! 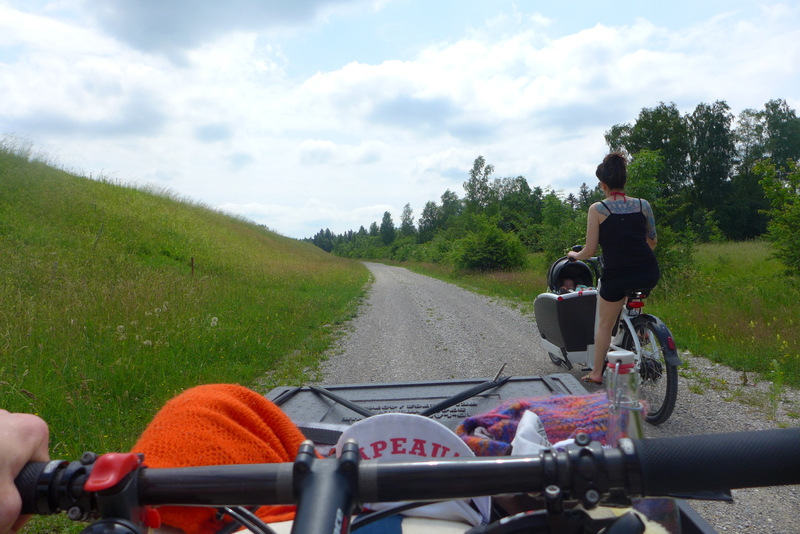 We happy to celebrate this and as we light the candles on the cake I will tell you a little recap of my cargo bike initiation. After 3-4 months of finding out we are going to have a lovely baby addition to our family, the transportation question hit. 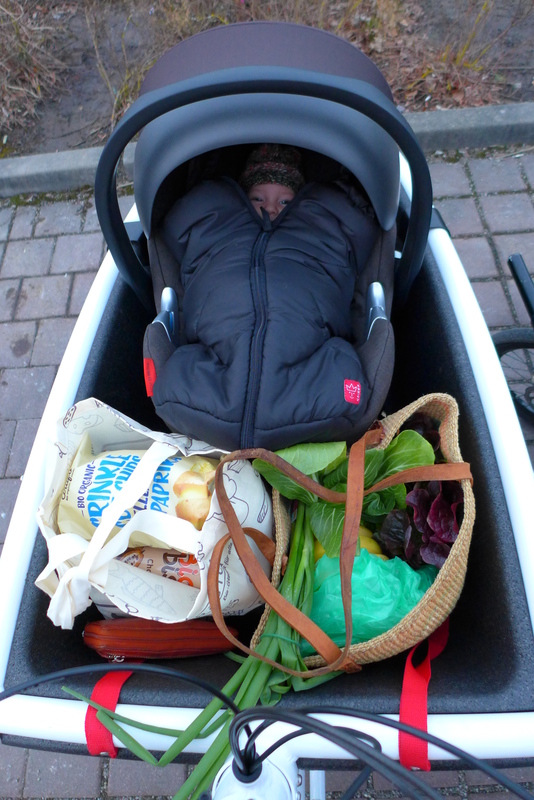 Being, that we were already living carfree, we had so find a solution to being mobile with a baby. 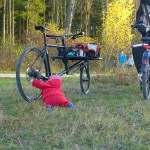 Options started flowing: public transportation, a car (although Sven can’t remember giving me that option) or cargo bike? 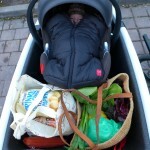 Certainly I am not a big fan of public transportation with a baby and neither did I like the car idea. 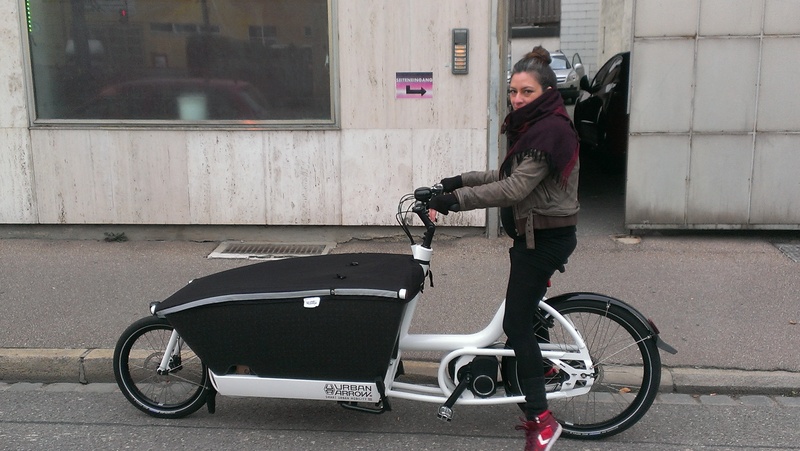 Sven threw out cargo bike suggestions ( bakfiets.nl, Christiania, nihola, UrbanArrow…. propably not a second Onmium… ) and I stayed home scouring the internet in search of something I was interested in. Most importantly, I was searching within myself, asking if I could really make this commitment, if I could pull this off. How will we manage? What are we going to do when it rains? OMG, what will we do in the winter, as we have this sweet little innocent baby of love, that we have to protect?? 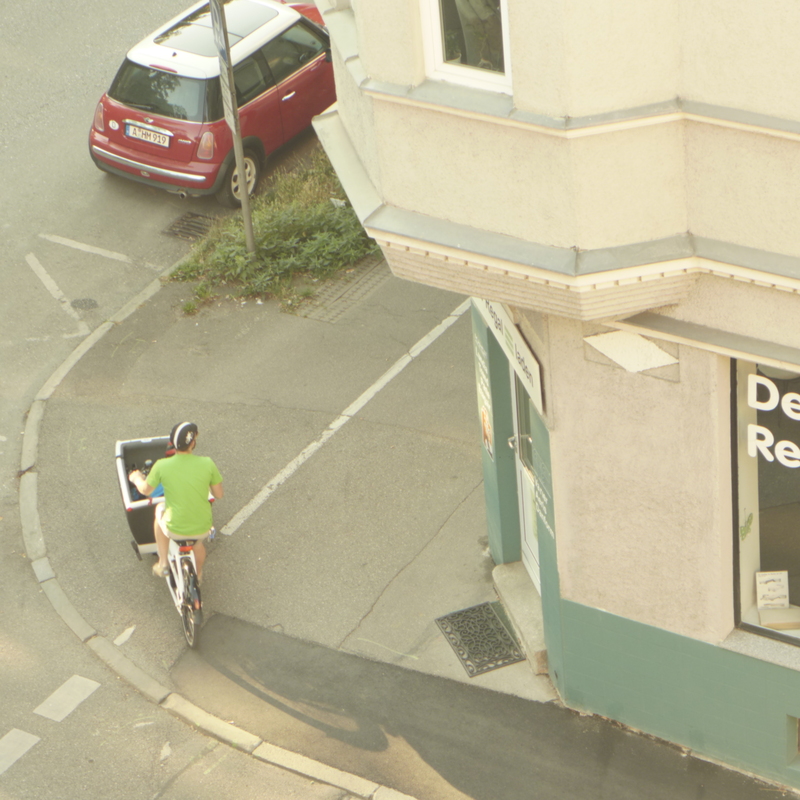 I remember visiting numerous websites, viewing photos and one day I came across a video on youtube that featured the Urban Arrow. 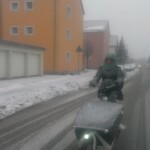 It was love at first sight: A strong secure build, electric assist, child friendly and weather compatible. Finally it became an easy decision: Make the commitment and invest in appropriate clothing. 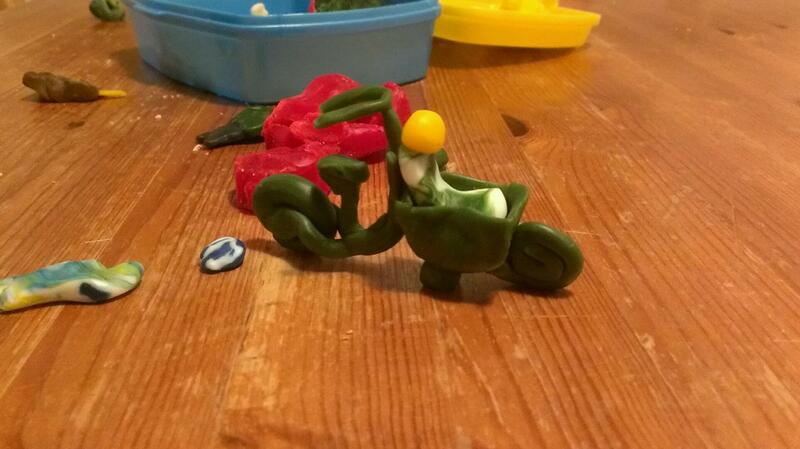 When Sven came home, I told him which bike I wanted and he agreed to that choice. 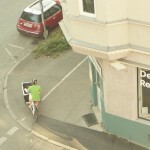 Shortly after that, a friend of Sven gave us the hint that packrad in Freiburg was having a good offer at the moment. We didn’t hesitate, rented a truck and brought it home. Ever since I’ve never looked back and never regretted my decision. 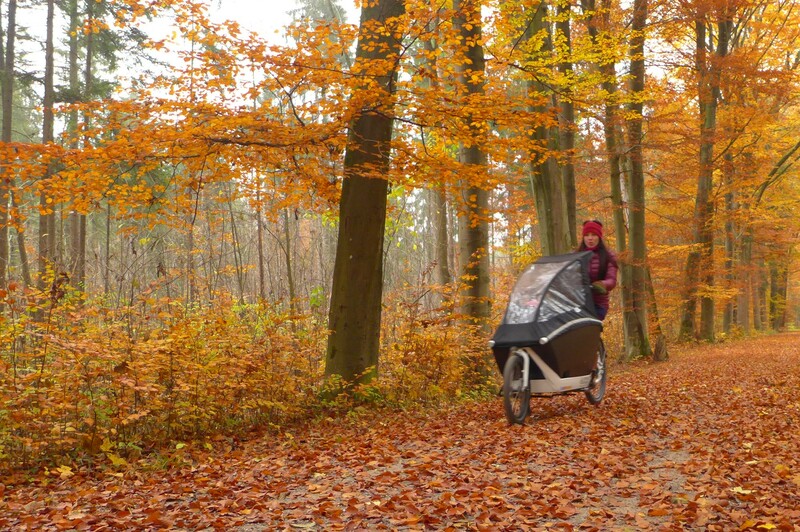 I began my cargo bike journey at six months pregnant and took a break two weeks before I giving birth to Anouk. The whale was exactly what I needed, being pregnant and nearly being a whale myself! 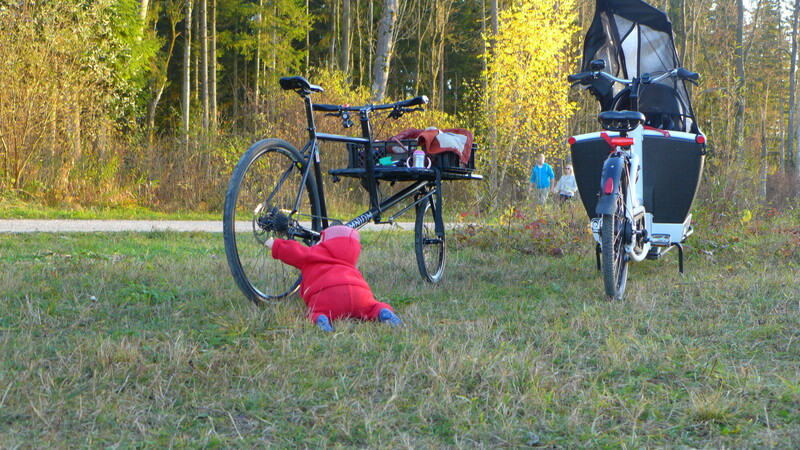 We started cycling together as a family again, when Anouk was 5 weeks old. Our spring and summer was fantastic. Trips around town and to the lake were a piece of cake! After the kids were packed, we still had room for Picnic gear! So here we go again. 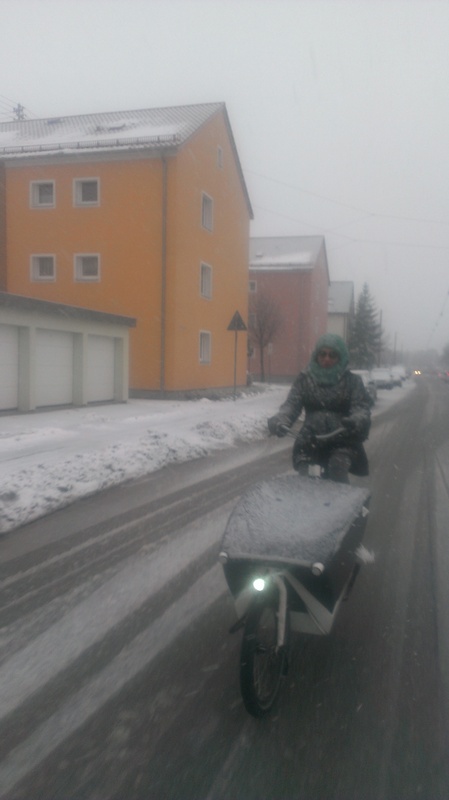 It’s our second winter and I’m looking forward to every ride. 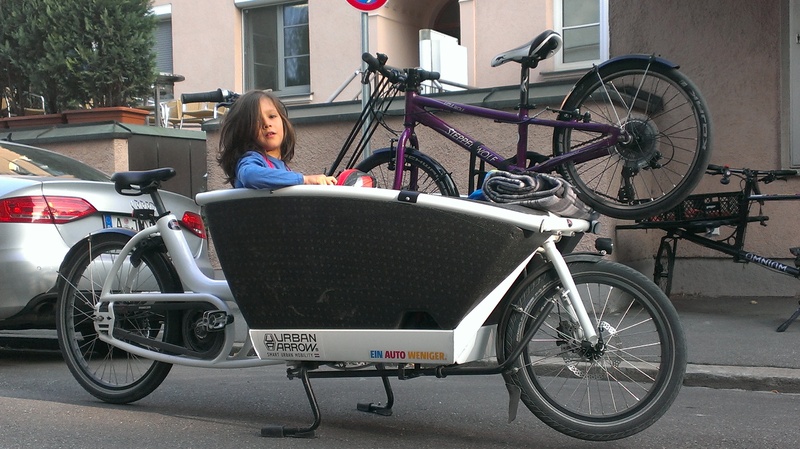 I can honestly say that I am satisfied with my decision to commit to a carfree living and our decision to get the Urban Arrow has fulfilled our needs and proved to be our number one choice for child transportation. Gray sky? Go ride the woods! Previous Previous post: That SOB!